Ballast Point, a popular brewery from San Diego, has opened a new brewpub in the neighborhood. The fresh arrival is located at 212 N. Green St. in Fulton Market. With 12,000 square feet to play with, Ballast Point brought its full brewing experience to the space, reports Brewbound. The brewpub features a three-barrel brewing system, a 38-seat bar with 100 taps, and a 250-seat restaurant. Plus, a rooftop bar is expected to open this summer. Visitors can choose from 40 to 50 different beers, as well as brews still under development and only available in Chicago. And from the kitchen, diners can order contemporary American dishes -- including fish tacos, bratwurst and burgers -- made with seasonal and locally sourced ingredients. Thus far, Ballast Point has a four-star rating out of eight reviews on Yelp. Levi A., one of the first Yelpers to review the new spot, said, "Great beer, ambiance, and amazing food. One hundred beer taps, veggie options, friendly knowledgeable staff. Props to everyone working the kitchen because I've never had such amazing food and dessert at a brewery." And Cassandra F. wrote, "Great space for a brewery; the place was packed and very lively, and the bartenders still were attentive and moving at a quick pace considering the amount of people in there. It's a huge open space with great beers and tasty bites." 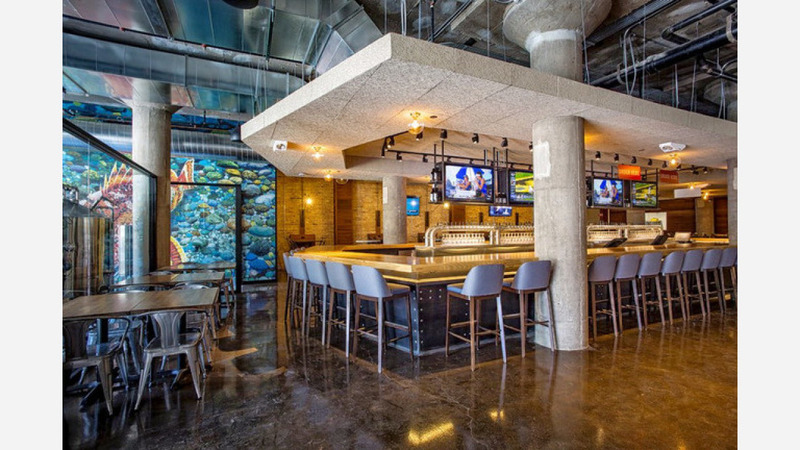 Head on over to check it out: Ballast Point is open from 11 a.m.-11 p.m. daily.